This was perfect on our deck and the quality is really nice! Totally recommend these for a small area on the deck around the pool. 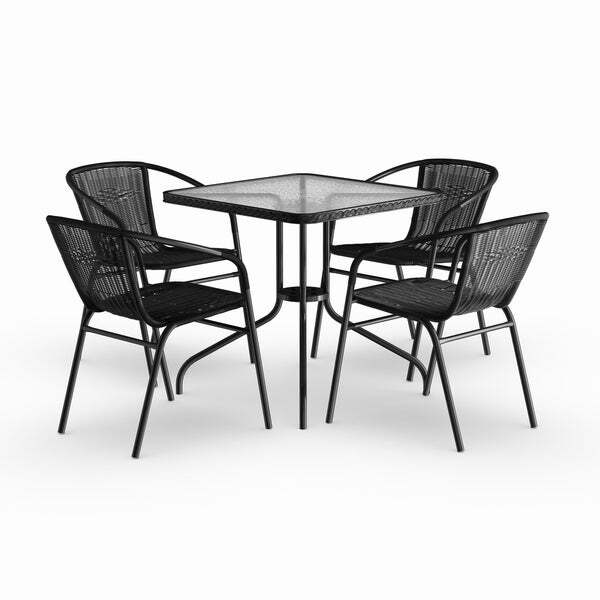 This five-piece outdoor dining set by Havenside Home is perfect for patios or poolside lounge areas. The simple square table features a glass table top with braided rattan edging for a charming and stylish touch. Four comfortable rattan chairs are lightweight for easy movement and stackable for convenient storage during the winter months. With your choice of three classic color choices, this outdoor dining set looks great as part of any home patio set. The only problem I find with thus purchase is the quality of the table. The table has a wicker braid detail on the border of the glass top. This beautiful detail was coming off just the first day we put it out in our patio. Had to glue it back on but it keeps coming off all around. Otherwise, chairs and table are very steady and strong. The picture did not give this set the credit it deserved. I was so grateful that the chairs came already assembled and the process to assemble the table was a whiz. Items came well packaged. Love the grey rattan trim around the table which compliments the sturdy chairs. Really enjoying my purchase and how well it fits on my patio. 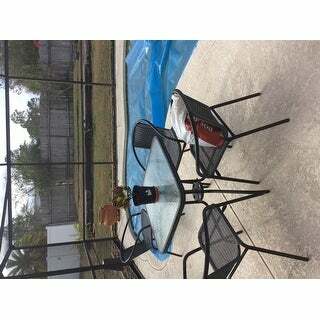 We are very pleased with our purchase of the Porch & Den Stonehurst Russet 5-piece Square Metal/ Glass Table with Rattan Chairs Set. It looks great on the patio. The price was perfect. Very nice set for my long, but not too wide patio. Chairs are comfortable and the table has enough space for 3 elegant settings (that’s all I need). Wonderful set for the money! Great outdoor set. The pieces arrived in a timely manner in two boxes. The chairs come fully assembled, which is really convenient. The table piece requires minimal assembly. The table base was a little damaged during transit but, after reaching out, I will have a replacement part shipped. Looking forward to using this on my terrace. Excellent for a small patio. Chairs come assembled. Very sturdy and wide seating. Table easy to assemble. Great outdoor furniture for small space. This table and chair set is the perfect size for my small-ish patio. It doesn't take up too much room, yet the table is large enough that I can serve dinner on it without it overcrowding. The stackable chairs are a great space saver too. The chairs came assembled, and the table was a breeze to put together. The first table top was scratched but Overstock was great in sending me a replacement quickly. I plan to get a lot of use out of this set now that the weather is cooling down. I recommend it! 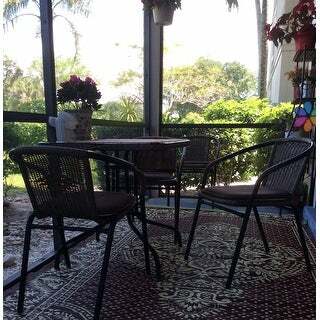 We bought this rattan table and chair set for our condo lanai in Florida. It is very well made and the brown color is very rich in color. The chairs are comfortable and the table is very functional. I bought this set to my apartment balcóny . Fix perfect and look very nice. It is confortable also. Perfect size for medium sized deck, lightweight to be able to handle alone, comfortable! Love this set! I have had the set since October. Love the set and no problems with. Very disappointed this came in and I only had 2 chairs instead of 4. The product looks great. The chairs was already put together all I had to was take it out of box. the table was much smaller than I expected. I would have ordered a larger set but this will do for now. It can be used for snacks and drinks I would not recommend this for outside dining. This is a great small patio set for on a balcony. We bought it for our condo ad it is just perfect....lightweight yet sturdy enough to withstand the wind. The chairs are comfortable even without a chair pad and the table is just the right size. Very, Very pleased with this purchase. "what is the maximum weight the chairs will hold?" I haven't asked the weight of those who have sat in the chairs but a good-sized over 6' tall guest didn't collapse the chair. I think this question might best be answered by the manufacturer. "What are the table dimensions and the chair dimensions?" The table is approximately 28 inches wide x 28 inches deep x 28 inches high. The chairs are approximately 21.75 inches wide x 23.5 inches deep x 28.5 inches high. "If i wanted to purchase patio chair cushions for these chairs, would most basic size ones fit?" "Does the table have a hole for an umbrella?" No. But it's a lightweight table, and it wouldn't be stable with the weight of an umbrella if any wind happened by. I've had mine outside on the deck for months in lots of different weather and so far it still looks new, and cleans up easily. I think it was worth the money. Need a smaller set for more seating/eating on our deck and the price was nice, the only thing is I wish they would of given the measurements on the chairs, I would like to buy cushions for them too. "What are the differences between this set and ITEM# 18955656?" Unfortunately this item is out of stock and we currently do not have inventory to check.